Ya know what I hate?! When I was putting the Christmas wrapping paper away this year, I had just had it with the used wrapping paper thing and decided to seek a solution! Well, Ladies...Pinterest has changed my life- ONCE again! Cut toilet paper rolls to cover wrapping paper...Genius! I don't think that this DIY really needs a detailed explanation, and or if this even qualifies for the link up, butI figured I would share anyways. 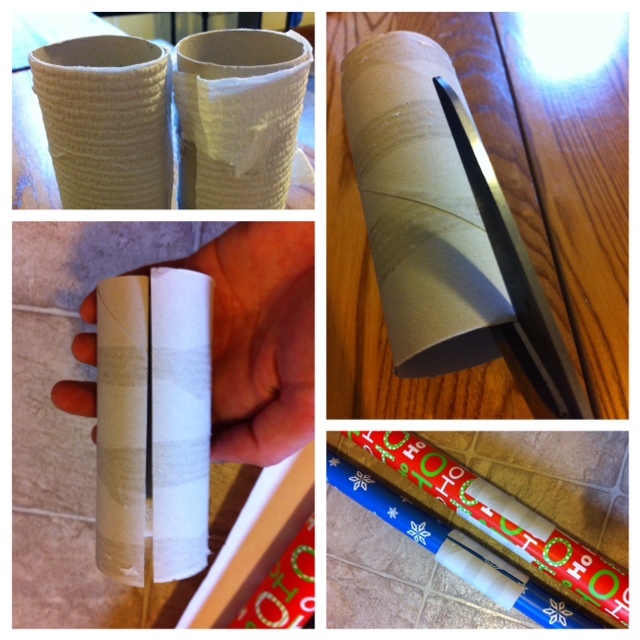 1. save your toilet paper rolls 2. cut them down the side 3. place around the wrapping paper! Have a paper towel roll!? Event better! Link up with a BEAUTIFUL mess and Keep Calm & Carry On. Great idea!!! :) New follower from the link up! this totally counts! ;) what a great idea. Wrapping paper organization seriously drives me NUTS! Great tip ... I currently use hair ties - this seems WAY better! This is so smart! wrapper paper drives me crazy. I usually just throw the whole roll away because I can't handle it. OMG genius!!! I hate when the wrapping paper comes unrolled! So easy! I need to do this! I just saw this pin the other day and thought it was the best idea ever (besides that cupcake idea)! Maybe next Christmas half of my wrapping paper won't get crinkled and torn. I love it! How useful. I can see how that cupcake is life changing. Looks delicious!